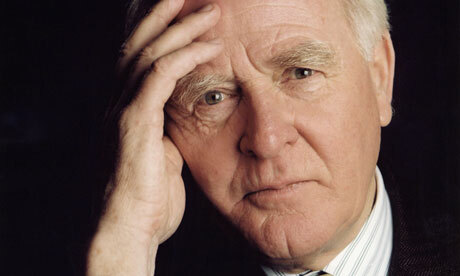 I always enjoy a good John Le Carre novel and his recent book "A Delicate Truth" was no exception. Le Carre seems to be taking an increasingly jaundiced view of the British government and it's intelligence agencies, in particular the unholy alliance between "New Labour" and neo-conservative political and industrial players from the US. "Delicate Truth" tells the tale of a civil servant from the Foreign Office who is caught up in the machinations of a dodgy Minister and an unethical military contracting firm calling itself "Ethical Outcomes". "Delicate Truth" has received better reviews than some of Le Carre's other recent novels, with this piece from the Sydney Review of Book being a good example - Cast As A Spy. A Delicate Truth is a return to form. It’s not The Spy Who Came in from the Cold, but it is a much more impressive and engaging book than Our Kind of Traitor, and in many ways it has an edge on A Wanted Man. We are not quite in the heartlands of le Carré’s mythic stamping ground, but we are in a place of murky darknesses and grey confusions. We are in the realm of the horrors that can be perpetuated under the cloak of security, in a world where every cloak must always come with a dagger, and truth and justice are liable to be stabbed to death. A Delicate Truth could scarcely be more pertinent (for what that’s worth) because it is concerned with the kind of moral anxieties that afflicted Bradley Manning – who was mercifully found not guilty on the capital charge of aiding the enemy, but went down heavily nonetheless – and brings to mind the controversies surrounding WikiLeaks founder Julian Assange and the fugitive American whistleblower Edward Snowden. Indeed, Simon Jenkins, the former editor of the Times, recently singled out A Delicate Truth as an allegory of the evils currently in play. Like all Le Carre novels it ultimately ends in tragedy but I enjoyed the ride.